Durham School, Quarryheads Lane, DH1 4SZ. a. Foundation stone was laid in 1924. The building project was completed in and dedicated 29th July 1956. Chapel building of Gothic style. There is a plaque with raised plain border, with a small cross on each side of the first sentence. The lettering is raised in carving in a sunken panel using elaborate capitals throughout. Inside the building, the stone pillars have the inward facing sides inscribed with the names of those who died from both 1914-18 and 1939-45. The panels are sunken with the lettering raised in half relief, using elaborate upper case lettering. At the top of each panel are. the words “Pro Patria” below which is the date in Roman numerals, followed by the names in a single column on each, sometimes overlapping onto the next line. The 97 steps leading to it equal the numbers of those who died. Plaque by steps 36 inches wide x 24 inches high overall 40 inches by 28 inches. A meeting place for the greater glory of God and for those who met their death in the greatest war of all. Their friends, remembering them, built this shrine in 1926. Contributions from Old Boys and Friends of the School. Good. See Note 1 below. Builders Rudd and Son of Grantham. Designer - Walter Brierley of Brierley and Rutherford of York. 1. The 98 steps leading up to the chapel represent the number of the fallen in 1914-18. They were originally made of wooden railway sleepers, but these have been replaced with concrete in memory of those who died in 1939-45. These were refurbished in 2006. 2. The building was to have been twice as long, but funds did not permit. 3. Those names for the First World War are engraved on a series of eight pillars, and those for the Second World War were added above them. They are engraved in alphabetical order, starting from the North-west pillar and proceeding in a clockwise direction to the South-west pillar. Each section of names is head with “Pro Patria”, followed either by MCMXIV-XVIII, (1914-19) or MCMXXXIX-XLV (1939-45). The hyphen between the years is sometimes replaced with a cross – there appears to be no common pattern to that aspect of the engraving. The photographs illustrate this. 4. The stone laying ceremony was carried out on the same day as the school prizes were presented. 5. 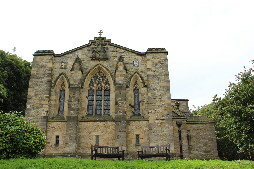 The design of the chapel was won in an architectural competition. The papers are in the Borthwick Institute. 6. A former pupil, killed on the Somme, was poet William Noel Hodgson. He attended the school from 1905-1911. Durham County Advertiser 11/07/1924; 30/09/1926. Illustrated Chronicle 04/07/1924 reports unveiling with photos inc. school prize giving. Borthwick Institute, University of York holds papers and plans by Brierley and Rutherford 1923-35. Ref: 6/23. Durham – the photographic Collection, Michael F Richardson – ISBN 0 75093282 1, carries a photo of the Chapel under construction. Fassett Arborin Burnett - CWGC Database shows “Arbouin”. Ernest John Robinson Briggs Gooderham - CWGC Database has Briggs-Gooderham. John Edgar Hirst Hurst - CWGC Database has Hurst and Hirst reversed. 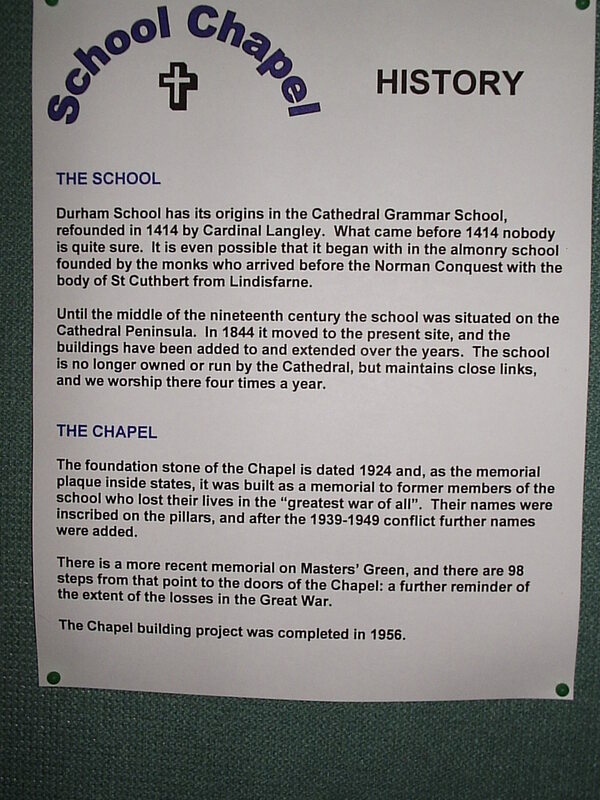 A brief note on the history of the Chapel is pinned on the notice board. 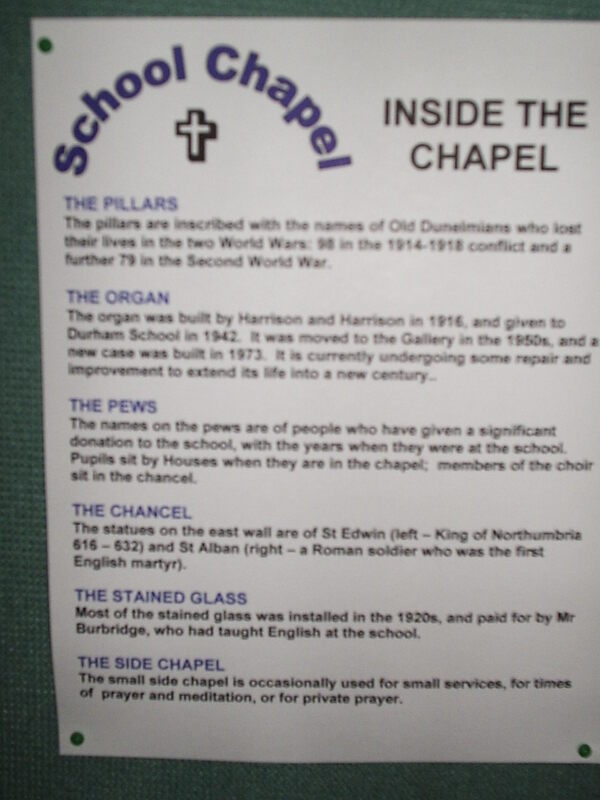 A second page describes some features of the interior of the Chapel. On each pillar, the names for 1939-45 are above those for 1914-18. *The Durham School Register gives “Procter”. Captain C.T. Adamson, 29th N.F. Sec.Lt. R.W. Adamson, 7th D.L.I. Lieut. W. Boyd, 8th D.L.I. Lieut. A.G. Brown, ? N.F. Capt. ? Buchanan, 6th West Yorkshire Regt. Lieut. C.P. Caesar, 7th Shropshire L.I. Lieut. T.W. Callinan, 8th D.L.I. Sec.Lt. W. Charlton, 4th East Lancashire Regt. Capt. A.J. Dingle, 6th East Yorkshire Regt. Sec.Lt. C.B. Dodds, 12th N.F. Sec.Lt. C. Fosbrook, 6th D.L.I. Sec.Lt. N. Gawan-Taylor, 3rd Yorks and Lancs Regt. Lieut. P. Gedge, 7th Suffolk Regt. Capt. R.C.M. Gee, 15th D.L.I. Lt. M. Greville-Jones, 1st N.F. attached R.A.F. Capt. W.A. Guest-Williams, 2nd Royal Berkshire Regt. Sec. Lt. R.W.C. Gunn, 3rd Notts and Derby Regt. Lieut. R.L. Guy, 6th N.F. Lt. B.St.G. Hamilton, 15th Batt., M.G.C. Lieut. G.K. Hampton, 4th Norfolk Regt. Sec.Lt. J.W.S. Hird, 9th North Staffordshire Regt. Pte. J.F.A. Hirst, 29th R.F. Lieut. W.N. Hodgson, 9th Devonshire Regt. Lieut. C.G. Hosking, R.A. and R.F.C. Capt. H.F. Hosking, 66th Punjabis, I.A. Pte. G.A.W. Hulley, 4th K.O.Y.L.I. Sec.Lt. J.T.G. Humphries, 40th Pathans, I.A. Capt. N.F. Humphries, Tank Corps. Lieut. G. Jacob, 1st East Yorkshire Regt. Capt. G. Kirkhouse, 8th D.L.I. Capt. F.H. Lawson, 5th N.F. Capt. Y.A. Leeson, 11th D.L.I. attached M.G.C. Capt. R.H. Legard, 2nd D.L.I. Major E.W. Longden, 4th Yorks. and Lancs. Regt. Capt. F.G. Longden, 4th D.L.I. Lt.Col. B.L. Maddison, 8th Yorks. and Lancs. Regt. Capt. W. Marley, 5th D.L.I. Sec.Lt. H.G.H. Marshall, Tank Corps. Capt. W.M. Morant, 7th D.L.I. Sec.Lt. A. Morgan, Royal Air Force. Capt. W.N.J. Moscrop, 5th D.L.I. Corpl. M.C. Neilson, 21st R.? Capt. F.L. Newstead, 3rd D.L.I. Lieut. N. Oxland, 8th Border Regt. Sec.Lt. M. Procter, 5th Yorks. and Lancs. Regt. Sec.Lt. R.G. Rayner, 8th N.F. Sec.Lt. H.W.T. Reed, 2nd Monmouthshire Regt. Sec.Lt. B.H. Richardson, 8th D.L.I. Lt.Col. C.L. Robinson, 1st Monmouthshire Regt. Pte. G.S. Robinson, 1st East Kent Regt. Capt. A.D. Shafto, 2nd Royal Scots Regt. Lieut. H. Stewart, 3rd D.L.I. Capt. H.R. Telford, 21st N.F. Lieut. H.K. Temperley, 8th N.F. Sec.Lt. K. Tindle, 7th D.L.I. Lieut. A. Todd, 4th D.L.I. attached R.F.C. Capt. J.G. Todd, 23rd N.F. Lieut. J.D. Tombs, 7th Border Regt. Lieut. F.E.S. Townsend, 5th D.L.I. Rev. E.W. Trevor, Chaplain to the Forces. Lieut. T. Tweddell, 3rd Yorkshire Regt. Major C.A. Wilkinson, 3rd Shropshire L.I. Pte. H.F.C. Winch, 3rd Infantry Batt., Australian Imperial Forces.